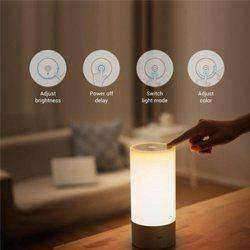 Yeelight LED Ceiling Light - The World's First Lamp to Support both WiFi and BluetoothThe Yeeli..
Main Features: - This is a fan with no fan blade, less noise, uninterrupted stream of smooth ai..
Main Features:• Original xiaomi smart wireless switch for home device• One key to control: .. Original Xiaomi Yeelight Blue II LED Smart Bulb ( Color )E27 9W 600 Lumens Mi Light Smart Phone WiFi..
Xiaomi Mi Yeelight YLFW01YL Smart Candela Light 6W LED Wireless Mijia App Control Yellow Home Light ..
Xiaomi Yeelight Bedside Lamp - 365 Different Colorful NightsThis lamp uses high CRI osram LED, .. Description:Mijia Smart LED Desk Lamp - Simple But Not EasyThe new Mi lamp comes with four lighting .. Description:Xiaomi Yeelight RGBW E27 Smart LED Bulb is a great addition to Xiaomi Yeelight Seri..
Yeelight Human Body / Photosensitive Sensor Induction LED Ceiling Light AC220 - 240VThe LED ceiling ..
Decorate your home with a waterproof lamp to enhance the sense of space, and to subtly divide t..